This report is based on data collected within the AccessSTEM/AccessComputing/DO-IT Longitudinal Transition Study (ALTS). It tracks the college and career pathways of students with disabilities who have participated in activities sponsored by projects of the DO-IT Center at the University of Washington (UW) in Seattle. Students are added to the study as they enter DO-IT programs and agree to participate in this research activity. To date, 472 students with a wide range of disabilities have agreed to participate in this ongoing study. In the ALTS study participants are asked about educational and career pathways and outcomes. Additionally, they are asked to identify the DO-IT activities they participated in and rate the value of the activities. As this database grows, both in number of participants and number of interviews per participant, it is expected to reveal the long-term impact of DO-IT’s program activities. That is, it will indicate which activities participants consider most beneficial and which are most important for achieving positive postsecondary outcomes. This report is an update of the initial 2007 report, the 2009 report, 2010 report, and the 2011 report. The AccessSTEM/AccessComputing/DO-IT Longitudinal Transition Study was developed with funding from the Research in Disabilities Education program of the NSF (award HRD-0227995 and HRD-0833504) for the Alliance for Student with Disabilities in Science, Technology, Engineering, and Mathematics (AccessSTEM). The DO-IT Scholars program, in which many study respondents participated, has been primarily funded by the National Science Foundation, NASA, Microsoft, Boeing Company, and the State of Washington. The Alliance for Access to Computing Careers (AccessComputing), funded by NSF’s Directorate for Computer and Information Sciences and Engineering (grant #CNS-0540615, CNS-0837508, and CNS-1042260). The ALTS continues to be maintained by AccessSTEM, AccessComputing, and the State of Washington. What are the educational achievements of participants in DO-IT interventions? Do they differ from other youth with disabilities with regard to educational achievements? What are the employment outcomes of participants in DO-IT interventions? Do they differ from other youth with disabilities with regard to employment achievements? Which interventions are regarded as most valuable? Are patterns evident linking student demographics or interests with the intervention(s) used and their perceived value, or with student pathways? Is there evidence of how interventions might be improved or expanded to be more beneficial or more broadly beneficial? The ALTS tracks the progress toward degrees and careers of students with disabilities who had a goal of postsecondary education while in high school and received DO-IT sponsored interventions (e.g., internships, mentoring, college transition activities) in high school and/or in college. Many DO-IT sponsored interventions were funded by the National Science Foundation (NSF). The study is designed in such a way that respondent content can be updated and data can be analyzed at any time. The “on track” status of students is determined as they progress through critical junctures that lead to degrees and careers in science, technology, engineering, and mathematics (STEM), recognizing that at any point some respondents in the study are still enrolled in secondary school or are recent high school graduates. The progress of ALTS respondents is compared with that of participants in the National Longitudinal Transition Study-2 (NLTS2)(SRI International, 2001-2011) which is a follow-up of the original National Longitudinal Transition Study (SRI International 1985-1993). Although ALTS participants were not randomly selected and the two groups are not identical in characteristics, both groups are composed of college-bound youth with a wide range of disabilities and interests. The DO-IT Scholars program, for example, works with students who have many different academic and career interests; AccessSTEM participants are interested in careers in STEM; AccessComputing participants are interested in careers in computing and information technology (IT) fields. The ALTS Logic Model provides a visual representation of activities in which respondents were involved as well as project goals, outputs, outcomes, and long-term impacts. We intend to expand ALTS with new participants and with longer-term follow up to gather data that will enable us to evaluate both the short-term and the long-term impact of specific activities designed to increase the college and career success of individuals with disabilities, particularly in STEM fields. This study is responsive to the recommendation of the NSF Committee on Equal Opportunities in Science and Engineering (2004) to make an effort to collect more and higher-quality data about factors that promote the success of individuals with disabilities in STEM fields. Recruited through their participation in DO-IT activities, respondents in this study were interviewed in person, by email, and/or by phone. Their records were added to an online database. Content stored in the database includes demographics, assistive technology usage, involvement in program activities, stages of progress through critical junctures leading to STEM careers, participants' reasons for discontinuing progress toward a STEM career, and career outcomes. The ALTS database is analyzed by an external evaluator. Since this is a longitudinal database, DO-IT staff strives to re-interview ALTS participants every other year (per stipulations of the UW’s Institutional Review Board) during their annual round of ALTS re-interviews. Additionally, records are updated between interviews with information gathered through other participant contacts. Of the 472 ALTS participants, about half (234) have participated in at least one formal follow-up interview and almost half of these (109) have participated in two to five follow-up interviews. Two hundred thirty-eight of the respondents have participated in only a baseline interview, though information about many of these participants has been updated through other types of contact. It can be difficult to determine whether DO-IT has lost touch with a participant or whether that individual simply has been unavailable for interview during the interview period. Eighty-seven percent of the 472 participants have been confirmed as still being in touch with DO-IT, though for 10% of these, their most recent formal interview was prior to 2009. Informal contact has kept their records up-to-date. The following paragraphs provide an overview of findings from some of the data collected thus far in the ongoing AccessSTEM/AccessComputing/DO-IT Longitudinal Transition Study. 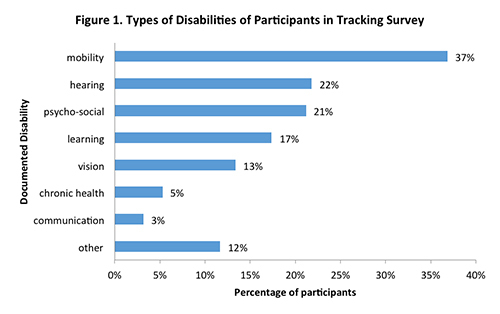 Figure 1 illustrates the prevalence of different types of disabilities among ALTS participants. More than one-third of the respondents (37%) reported a mobility disability; nearly one-fourth (22%) are deaf or hard of hearing. Nearly as many (21%) reported psychosocial issues. Others reported a learning disability, low-vision or blindness, a chronic or acute health condition, or a communication disorder. Males and females were about equally likely to have disabilities related to communication, chronic illness, hearing, vision, and learning issues. Female ALTS respondents were more likely to have a mobility disability (46% vs. 31%) while males were more likely to have a psycho-social disability (29% vs. 145). 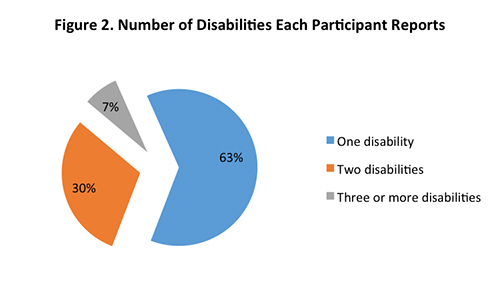 Figure 2 shows the percentage of participating students reporting one (63%), two (30%) or three or more (7%) disabling conditions. Figure 3 shows the participants’ educational status when they entered DO-IT. Six (1%) began participation in DO-IT activities in middle school, 306 (65%) in high school, 134 (29%) as college undergraduates or in their transition summer between high school and college, 21 (4%) as graduate or law students, and 3 (1%) as post graduates or job seekers. Respondents participated in the following evidence-based practices. Technology access. Although 91% of the respondents had access to a computer before they participated in program activities, 54% reported that DO-IT provided them with computer equipment after joining DO-IT. Further 49% said they received training from DO-IT on their computer or software and 44% said they received tech support from DO-IT. Eighty-six percent had access to the Internet before they joined DO-IT and 97% said they had Internet access after joining, 5% from DO-IT. The percentage of the respondents in the current study with access to assistive software or hardware was quite low before DO-IT participation (31%), up to 63% after participation in program activities. Forty-two percent reported that these assistive technologies were provided at least in part by DO-IT. Adaptive software available to project participants includes scanning/reading, word prediction, mind mapping/outlining, speech recognition, and screen magnification software. Adaptive hardware includes alternative keyboards and mice, use of a braille embosser, a portable digital assistant, and an augmentative communication device. Internships and Other Work-Based Learning. Three-hundred and twelve (66%) of respondents completed at least one internship, and 76% of these students reported that at least one of their internships was provided by DO-IT. Of the 663 internships completed, 370 were developed through DO-IT projects. The total number of internships completed by each respondent ranged from one to ten. Fifty-nine percent of the participants with internships (39% of the participants overall) had paid internships. Mentoring. Ninety-two percent of respondents reported having access to mentors during program participation, up from 55% with either an adult mentor or peer group support before participation. All 272 DO-IT Scholars indicated that they participated in internetworking and mentoring. College and Career Transition Workshops/Camps. Eighty-two percent of the respondents indicated that they participated in a college or career transition workshop. Other STEM Activities. In addition to the aforementioned experiences provided through DO-IT, 34% of the respondents reported that they were involved in extracurricular STEM service groups, clubs, or other activities that were not sponsored by AccessSTEM, AccessComputing, DO-IT Scholars, or other DO-IT programs. Figure 4a summarizes respondent perceptions regarding the value of program activities as they prepared for college and careers, in order from most to least valued as indicated by the percentage of valuable and very valuable ratings. Access to technology was reported to be the most valuable intervention, with 74% of the respondents noting that that intervention was very valuable, followed by internship or other work-based learning, rated as very valuable by 61% of those who participated, and as valuable by another 29%. Next, 43% of participants rated college transition workshops or camps as very valuable and another 41% rated them as valuable. Mentoring was also seen positively, with 47% indicating that it was very valuable and another 33% saying it was valuable. However almost one-fifth (18%) found it somewhat valuable, a diversity of responses that may lead to some insight into the qualities of a valuable mentorship experience in future interviews. Similarly, additional feedback about career transition workshops and camps may yield ideas for improvements that will increase the value of those activities to more participants. Nine DO-IT staff members who worked the most on multiple activities with DO-IT participants were also asked to rate the value of these program activities. Table 1 and Figure 4b show the results, with activities listed in the same order as above. Note: Participants and staff rated all interventions highly; even the lowest rated item, career transitions workshops/camps, was rated valuable or very valuable by 75% of participants and 89% of the staff. Overall, 424 ALTS respondents were known to have graduated from high school at the time of the most recent interview. Most ALTS respondents (313; 66%) enrolled in a DO-IT program prior to high school graduation. Of the 296 who were eligible both to graduate and participate in a second interview, 90% have confirmed high school graduation. The remaining 31 students have not yet been re-interviewed. Twenty-one of these remaining 31 students (68%) earned academic and other achievement awards in high school, suggesting school success. However, these students have not been available for a follow up interview. Thus the available data indicate a 100% high school completion rate of those who have been contacted and a 90% high school completion rate of all eligible students. In comparison, according to the NLTS, the high school completion rate for youth with disabilities in 1987 54%, up to 70% in 2003 according to the NLTS2. A nationwide survey of individuals with disabilities (NOD, 2004) reported that students with disabilities drop out of high school at a rate that is double than that of the general population (21% vs. 10%). According to the National Center for Education Statistics the rate of high school completion in the general population was 83.9% in 1980, up to 89.9% in 2008 (NCES, NCES2). Among the ALTS respondents who completed high school, five (1%) mentioned completing high school by passing a high school equivalency exam (e.g., GED) as compared to the national rate of 5.5% in 2008 (NCES). These students entered the DO-IT program as undergraduates. 96% (409) enrolled in college, with 79% of these attending four-year colleges and 52% attending two-year colleges. 52% (214) of the 409 ALTS respondents who have enrolled in college have each earned between one and three degrees for a total of 285 degrees. Eight individuals have each earned three degrees, 55 individuals have each earned two degrees, and 151 individuals have each earned one degree. A total of 37%/67%/58% of ALTS respondents at two-year/four-year/graduate schools majored or minored in STEM. 214 have earned 285 postsecondary certificates/degrees; 145 (51%) of these degrees were in STEM fields. Table 2 provides more detailed information of participant passage through the "critical junctures" in the postsecondary educational process, including degree attainment and current status. Figure 5 summarizes this information. High school completers are defined as 18- through 24-year-olds not enrolled in high school that have received a high school diploma or equivalency credential. The table reports accomplishments, degree attainment, and current status. Note: These 214 participants completed 285 programs: 88 at two-year schools, 156 at four-year schools, and 41 in graduate programs. ALTS participants attend college at a higher rate: 409 (96%) of ALTS' 424 high school graduates attended college; 374 (93%) of these, within two years from high school graduation. By comparison, 77% of the NLTS participants had postsecondary goals in high school, and fewer than one third of these (31%) took a postsecondary course within two years after high school. ALTS participants are about as likely to start their postsecondary education at a technical or two-year college program as at a four-year institution (214 vs. 195). About half of both NLTS and ALTS participants who attended postsecondary school did so at a technical/two-year college. One hundred forty-nine ALTS respondents reported employment in 213 post-high school positions. This category was defined using stringent criteria (e.g., current jobs that were permanent or part of the college curriculum, and not temporary to get through school). Sixty-four percent of these positions were career-related and 45% percent were STEM-related. Thirty-seven percent were tech jobs. Below are findings about employed participants in the ALTS study. About half (52%) of the participants who were no longer enrolled in college were employed (n=100). These 100 participants had participated in significantly more internships than their 84 out-of-school counterparts who were not employed (2.4 vs. 1.4). Of those still enrolled in college (n=218), only 44 were employed and those 44 also had significantly more internships than their still-enrolled counterparts who were not employed (1.7 vs. 1.2). Among those not still enrolled in college, 58% of those who participated in extracurricular STEM organizations and activities were employed, slightly more than those who did not participate in such organizations (52%). Among those still enrolled in college, 23% were employed, whether or not they participated in extracurricular STEM activities and organizations. Sixty-three percent of participants who had transitioned to college had majored or minored in a STEM program. This figure was about the same for participants who were still enrolled or no longer enrolled (64% vs. 62%) and for participants who were employed or not (65% vs. 64%). Employed respondents are older (27 vs. 24 years), and had completed significantly more years of college. Additional analyses revealed some differences between ALTS participants who were employed during at least one of their interviews, and those who were not. Figure 6 shows that compared with ALTS respondents who are not currently employed, those who are employed entered DO-IT with less access to the Internet (80% vs. 89%), less use of an interpreter (7% vs. 17%), and less access to a mentor (32% vs. 42%). In contrast, Figures 7 and 8 show that employed ALTS respondents were more likely to participate in DO-IT activities and they participated more often than those who were not yet employed. It should be noted that some of this participation may relate to other differences between the groups such as age or years in college. However, even controlling for those factors, the overall picture remains that employed respondents seemed to experience less support prior to DO-IT involvement, and once support is made available, they seem to engage more. 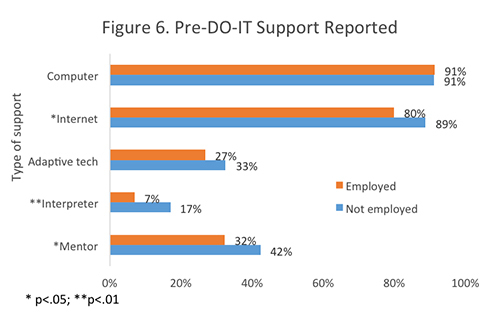 Specifically, Figure 7 shows that employed respondents were more likely to be DO IT Scholars; they received more training in hardware or software and more tech support; and they were more likely to participate in conferences, workshops, panels, and in pre-employment activities such as job preparation, informational interviews, and job shadows. Further, they were somewhat more likely to participate in all other activities, though the other differences did not reach statistical significance. Figure 8 shows differences in level of participation in DO-IT activities. Though ALTS respondents who are not employed indicated more participation with DO-IT peers, employed respondents reported that they participated in more conferences, workshops, panels, informational interviews and job shadows. Finally, employed respondents rated college transition workshops and/or camps (53% vs. 39% “Very valuable”) and mentoring (53% vs. 45% “Very valuable”) as significantly more valuable than did those who were not yet employed. Analysis of data collected in the AccessSTEM/AccessComputing/DO-IT Longitudinal Transition Study reveals that a large majority of respondents had access to computers and the Internet before participation in program activities. However, few had access to adaptive software or hardware before participation (31%) while most did after participation in program activities (64%). Respondents made significant gains regarding access to mentors as a result of program participation (from 55% to 92%). Staff rated all of these activities valuable or very valuable. While 17 ALTS respondents are still enrolled in middle school or high school, another 424 have already graduated and the others have not been reached for an interview since they were due to graduate. Thus all ALTS participants have either graduated from high school, are still attending, or have not been re-interviewed. All but one graduate received a high school diploma, and the other earned a GED. This represents a much higher graduation rate than other students with and without disabilities nationwide. The high rate of high school diploma recipients for ALTS respondents suggests promising interventions for students with disabilities, as well as a promising future for these individuals, as research indicates that students who earn high school diplomas are more than twice as likely as GED recipients to enroll in college; they also earn higher incomes as adults (Grubb, 1999). As far as the type of postsecondary institution attended, ALTS and NLTS participants who attended college were similar. About half of each group began their studies at a technical/two-year college. Nearly all (96%) of ALTS high school graduates attended a two- or four-year college, 93% within two years from high school graduation. This is a substantially higher rate of postsecondary participation compared to the transition rate of NLTS participants from high school into college. Although 77% of NLTS participants had postsecondary education as a goal in high school; only 31% actually took a postsecondary course within two years after high school. This finding is consistent with previous research that formed the basis of DO-IT’s various interventions. This study provides supporting evidence that the ongoing program supports developed from previous research made a difference in the ability of students with disabilities to successfully transition to and succeed in college and careers. At the time when the current data were collected, 37%, 67%, and 58% of ALTS respondents at two-year, four-year, and graduate schools, respectively, majored or minored in STEM. Two hundred fourteen students have completed 285 postsecondary programs. Of those degrees/certificates reported by ALTS participants, 145 (51%) were earned in a STEM field. A national postsecondary student aid study by the National Center for Education Statistics (NCES, Berkner et al., 2005) found that undergraduate students with disabilities choose natural sciences and engineering at the same rate as students without disabilities (18%), and that graduate students with disabilities are less likely than those without disabilities to major in natural sciences and engineering (9% vs. 13%). In contrast, almost half (45%) of transitioning ALTS participants, all students with disabilities, are choosing natural sciences and engineering. (Unlike the STEM figures reported above, this classification excludes math and social science majors.) At the level of four-year colleges and universities, 45% of the students reported a major or minor in natural sciences or engineering, compared to the 18% reported in the NCES study above. At the graduate level, 49% of the ALTS students reported a natural science or engineering major, compared with 9% of the students with disabilities overall and even compared with 13% of students without disabilities. Students enrolling in two-year or technical programs also reported natural science and engineering majors or minors above the national rate (27% vs. 18%). These results suggest that the DO-IT program is effective in promoting interest in natural science and engineering for students with disabilities, and, as a result is helping to fill the gap in natural science and engineering studies between youth with and without disabilities. Another DO-IT study suggests that DO-IT Mentors may be the single most effective intervention for stimulating an interest in STEM (Burgstahler & Cronheim, 2001; Burgstahler & Doyle, 2005). Another important impact of DO-IT programs is the increase in the sheer number of college graduates with disabilities as a result of program support, in STEM as well as in other fields of study. 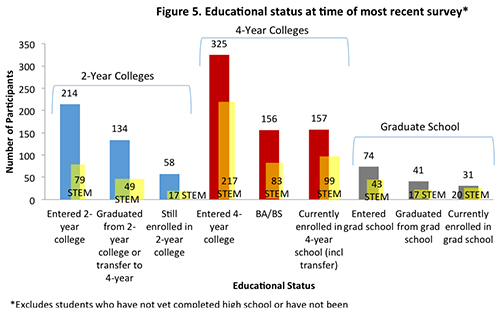 The total number of STEM degrees is likely larger than what it would be otherwise both because of the ability of DO-IT interventions to successfully encourage the exploration of STEM fields, but also because of the overall increase in the success of students with disabilities who participate in DO-IT programs, and the resultant increased size of the pool of college graduates with disabilities. Findings should be interpreted in light of the fact that DO-IT recruits students with disabilities into its activities even if they are not necessarily initially interested in STEM, though more than half (55%) reported a strong interest in STEM at recruitment. Of those students without a strong initial interest, more than four in ten (45%) majored or minored in a STEM discipline (compared with 78% of those entering the program with a strong interest in STEM). As noted in results of other studies reviewed in the "Summary of Earlier Research Results Regarding DO-IT Interventions" section of this report, research suggests that DO-IT interventions increase participants' overall perception of career options, particularly for girls, and the interest in STEM of those not initially interested in STEM. Employed participants were older and had more years of education than non-employed participants, 65% of whom were still in school. About four in ten (40%) of the employed students were working in STEM fields or in fields with significant technology demands. ALTS respondents who were employed seemed to have less support prior to their DO-IT participation and after enrolling, seemed more engaged in a greater variety of DO-IT activities, especially involvement in conferences, panels and job preparation activities. Many participants who pursued careers that are technically non-STEM (e.g., accounting, law, education, journalism) benefited from the STEM interventions and encouragement they gained through DO-IT activities and continue to support NSF goals. For example, participants encouraged to take mathematics courses through DO-IT activities became prepared to pursue math-intensive careers such as accounting. Participants who became teachers are now in positions to encourage other young people with disabilities to consider STEM careers. And, those who have become attorneys and other professionals serve as role models to young people with disabilities, helping them see career options that they thought were unavailable to them. Based on their positive responses to ALTS questions about the value of DO-IT interventions, it is likely that AccessSTEM activities supported NSF's goal to expand the STEM literacy of all citizens. Recognizing that at any point in time some respondents in the ALTS will be still enrolled in secondary or postsecondary studies, the researchers are developing measures and analysis for respondents considered "on track" with respect to their progress through critical junctures that lead to degrees and careers. Two-year college: ALTS participants who attended or are still attending a two-year college (and may have gone on to additional education) have attended classes over the course of an average period of 6 years or a median of 4 years (ranging from finishing the same year as enrolling to still enrolled or re-enrolled more than 40 years after initially enrolling). Participants who graduated from a two-year college attended college for somewhat but not significantly longer than those who have not yet graduated from a two-year college (6.8 years vs. 4.8). ALTS respondents who completed their two-year college programs took between less than one year and 28 years to complete their college education (at the two-year school or in another program), while those who are still enrolled in their two-year college programs have been enrolled in college from less than one year to more than 40 years. Among those who graduate from high school after enrolling in DO-IT programs, graduates of two year institutions attended for somewhat (but not significantly) longer than those who had not yet graduated (5.3 years vs. 4.2). Four-year college: ALTS participants who attended a four-year college and provided years of attendance data have attended college over an average period of 6.5 years (and a median of 5 years), with graduates having attended for significantly longer (8.2 years vs. 4.5 years). The number of years between enrollment and graduation (or year of survey if not yet graduated) ranges widely, from less than one year to more than 40. Restricting analysis to individuals who entered the DO-IT program prior to enrolling in college reveals that those who have graduated from a four-year institution have been enrolled for significantly longer than those who have not yet graduated (6.2 years vs. 3.0 years). Among ALTS respondents who started with DO-IT before enrolling in college, those who have already graduated attended college between two and 17 years, while those who were still enrolled at their most recent survey had attended between less than one year and 19 years. ALTS participants who entered the DO-IT program after having enrolled in college were enrolled in postsecondary institutions for significantly longer than participants who entered DO-IT before enrolling in college (7.7 years vs. 4.5 years). The DO-IT Scholars program, originally funded in 1992 by the National Science Foundation and now funded by the State of Washington, supports transitions from high school to college to careers for students with disabilities. DO-IT Scholars are college-bound high school students who face significant challenges in pursuing postsecondary studies and careers as a result of their disabilities. They are not necessarily initially interested in STEM fields, but program activities include those designed to increase interest in and knowledge about STEM. By providing on-campus summer study, year-round peer and mentor support, and work-based learning experiences, DO-IT helps these students develop self-determination, social, academic, technology, and career/employment skills to successfully transition to adult lives. A rich body of evaluation and research data has been collected on this program. It includes reports from Scholars, parents, and Mentors and analyzes the value of program interventions, perceived outcomes, and participant differences with respect to gender, disability, and STEM interest. Some of the results are summarized in the following paragraphs. Parents of DO-IT Scholars reported that DO-IT increased their children's interest in college; awareness of career options; self-esteem; and self-advocacy, social, academic, and career/employment skills (Burgstahler, 2002). DO-IT Scholars reported that DO-IT participation helped them prepare for college and employment; develop Internet, self-advocacy, computer, social, and independent living skills; increase awareness of career options; and increase self-esteem and perseverance (Burgstahler, 2003; Kim-Rupnow & Burgstahler, 2004). DO-IT Scholars reported the greatest effects of the Summer Study to be the development of social skills, followed by academic and career skills; and the greatest effects of the year-round computer and Internet activities to be the development of career skills, followed by academic and social skills (Burgstahler, 2003; Kim-Rupnow & Burgstahler, 2004). DO-IT Scholars considered themselves significantly improved in academic skills, social skills, levels of preparation for college and employment, levels of awareness of career options, and personal characteristics such as perseverance and self-esteem during the course of their participation in the DO-IT Scholars program, as demonstrated by their ratings at the following three time points—before their involvement in DO-IT, immediately following their first DO-IT Summer Study, and at the time they were surveyed (Kim-Rupnow & Burgstahler, 2004). DO-IT Scholars reported positive characteristics of email communication for peer and mentor support. Positive aspects of email included being able to stay close to friends and family; to get answers to specific questions; to meet people from around the world; to communicate quickly, easily, and inexpensively with many people at one time; and to communicate independently without disclosing their disabilities (Burgstahler & Cronheim, 2001; Burgstahler & Doyle, 2005). They predicted that access to the Internet would contribute to their success in college and careers, and reported that peer and mentor relationships provided psychosocial, academic, and career support, and furthered their academic and career interests (Burgstahler, 2003; Burgstahler & Cronheim, 2001; Burgstahler & Doyle, 2005; Kim-Rupnow & Burgstahler, 2004). In particular, most reported that DO-IT Mentors stimulated interests in STEM (Burgstahler & Cronheim, 2001; Burgstahler & Doyle, 2005). Those who participated in work-based learning opportunities reported increased motivation to work toward a career; knowledge about careers and the workplace; job-related skills; ability to work with supervisors and coworkers; and skills in self-advocating for accommodations (Burgstahler, 2001; Burgstahler, Bellman, & Lopez, 2004). DO-IT Mentors reported topics discussed with Scholars include STEM, college issues, disability-related issues, careers, computers, assistive technology, and the Internet (Burgstahler & Cronheim, 2001). A recent study (Burgstahler & Chang, 2009) compared the perceived benefits of program participation of participants with interests/strengths and/or career goals in science, technology, engineering, and mathematics (STEM group) and those without (non-STEM group). The current analysis shows that 55% of ALTS respondents indicated a “Strong interest” in STEM when they joined DO-IT; and 52% reported a STEM career goal. Nearly half (45%) of those who did not report a strong STEM interest when they joined DO-IT declared a STEM major or minor in college, as did about two-thirds (69%) of those who joined DO-IT with a strong interest. Males and females were equally likely to indicate a strong interest in STEM; however, significantly more male respondents identified STEM career goals (60% vs. 42%) and significantly more males declared STEM majors or minors in college (72% vs. 53%). Although respondents with learning disabilities were as likely as respondents with other types of disabilities to report a strong interest in STEM, significantly fewer reported a STEM career goal (42% vs. 54%) or declared a STEM major (51% vs. 66%). Respondents with a mobility disability were less likely to report a strong STEM interest (44% vs. 62%), a STEM career goal (37% vs. 62%), or declare a STEM major or minor in college (52% vs. 70%). Students with psycho-social disabilities were somewhat but not significantly more likely to have joined DO-IT with a strong STEM interest (63% vs. 53%), and significantly more reported a STEM career goal (67% vs. 48%) and declared a STEM major or minor (72% vs. 60%). Students with a visual disability were also somewhat more likely to indicate a strong STEM interest (67% vs. 54%), and significantly more likely to indicate a STEM career goal (67% vs. 50%) and declare a STEM major or minor (76% vs. 61%). Participants with a strong STEM interest and with a STEM career goal were more likely to declare a STEM major or minor than other students (STEM interest: 78% vs. 45%; STEM career goal: 80% vs. 45%). More students with a strong STEM interest rated mentoring as “very valuable” than those who did not indicate a strong STEM interest (54% vs. 40%). More of these students also rated access to computer technology as “very valuable” (79% vs. 68%). Finally, correlations between program participation and outcomes do not necessarily imply causation. Despite these limitations, it is still of some interest to compare available data about STEM degrees and majors of UW students with documented disabilities and students who have not disclosed disabilities. However, findings must be interpreted cautiously. It is important to keep in mind that most interventions undertaken by DO-IT since 1992 do not focus on the UW; instead, they reach out to students and institutions state-wide, regionally, nationally, and internationally. Some interventions encourage the participation of students with disabilities in STEM degrees (e.g., those funded by the National Science Foundation such as AccessSTEM,) but others are more generally focused on increasing the success of students with disabilities in college and careers; further, some STEM-related interventions reach out to students already interested in STEM fields, but most do not. It should also be noted that DO-IT interventions promote self-determination skills for students with disabilities and the application of universal design for instruction and student services. Together, these efforts can lead to fewer students reporting disabilities to DRS, as students make use of technology (e.g., Braille translation and speech output systems for students who are blind) and other interventions to gain access to curriculum and as faculty and staff make their resources (e.g., websites) more accessible to students who have disabilities. Table 3 below should be interpreted with these limitations in mind. It reports STEM degree and major information for UW students who disclose and for students who do not disclose disabilities. This table provides the total number of STEM degrees and majors for University of Washington students who disclosed disabilities and for those who did not in 1991, 2002, 2010, and 2016. For degrees, each of these categories is further sub-divided into Bachelors and Graduate; for majors the categories are sub-divided into undergraduate and graduate. This table provides the total number of STEM degrees and majors for University of Washington students who disclosed disabilities and for those who did not in 1991, 2002, and 2010. For degrees, each of these categories is further sub-divided into Bachelors and Graduate; for majors the categories are sub-divided into undergraduate and graduate. Degrees: The number of undergraduates with disclosed disabilities receiving STEM degrees increased almost ten-fold (873%) since 1991, compared with an almost doubling (93%) of undergraduates without disclosed disabilities receiving STEM degrees. This change is more dramatic among graduate students where the number of students with disclosed disabilities earning a STEM graduate degree increased 15 times (1400%), compared with just over a two-fold increase (103%) among graduate students without a disclosed disability during the same period. Majors: STEM majors among students with disclosed disabilities increased eight and one-half times for undergraduates (756%) and for graduate students (771%), while it doubled for undergraduates students without disclosed disabilities (102%) and increased 75% for graduate students without disclosed disabilities. Degrees: The number of undergraduates with disclosed disabilities receiving a STEM degree has increased more than four times (312%) since 2002 while the number of undergraduates without disclosed disabilities increased by 45%. 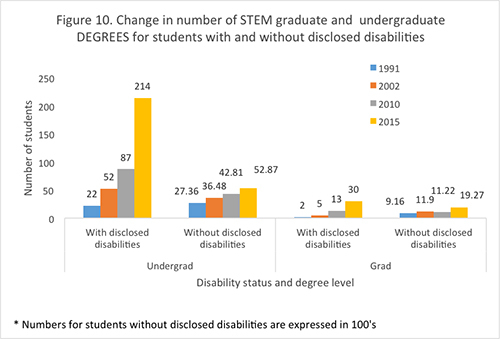 At the graduate level, six times (500%) more students with disclosed disabilities received graduate STEM decrees in 2015 than in 2002, compared with a 62% increase among graduate students without a disclosed disability. Majors: The number of undergraduates with disclosed disabilities declaring a STEM major has increased seven-fold (597%) since 2002 compared with a 63% increase among their peers without disclosed disabilities. The graduate level has seen an increase of four and one-half times (369%) in the number of STEM students with disclosed disabilities, compared with half as many again of graduate students without disclosed disabilities. Degrees: The number of undergraduate students with disclosed disabilities earning STEM degrees increased two and one-half times (146%) between 2010 and 2015 compared with a 23% increase in STEM degrees among their peers without disclosed disabilities. A similar pattern emerged at the graduate level with a 131% increase in graduate STEM decrees awarded to students with disclosed disabilities, compared with a 72% increases in STEM degrees awarded to their peers without disclosed disabilities. Majors: The number of STEM majors with disclosed disabilities increased more than four times (326%) between 2010 and 2015, compared with a 43% increase among their peers without disclosed disabilities. At the graduate level, three and a half times as many (or 249% more) students with disclosed disabilities declared STEM majors in 2015 than in 2010, compared with a 56% increase among their peers without a disclosed disability. Figure 9 shows that the number of graduate and undergraduate students majoring in STEM fields, at the UW, has increased between 1991 and 2015, regardless of disability status. However, the increase for students with disclosed disabilities is much steeper than for students without disclosed disabilities. 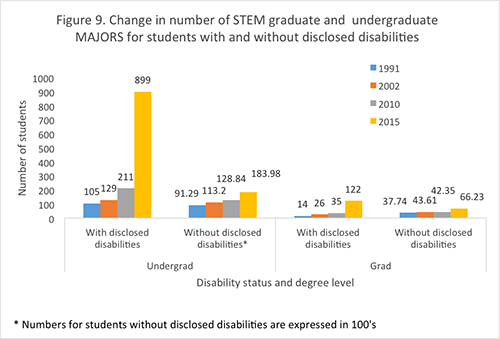 The number of STEM majors with disclosed disabilities increased much more sharply than the number of STEM majors without disclosed disabilities since the beginning of AccessSTEM. Figure 10 shows a pattern of change in STEM degrees awarded similar to the pattern of change in STEM majors. All groups show an increase in the number of STEM degrees since 1991, with a much steeper increase among students with disclosed disabilities at both the graduate and undergraduate level, than among their classmates without disclosed disabilities. The increase in STEM graduate and undergraduate degrees among students with disclosed disabilities continued their sharp increases since the beginning of AccessSTEM, while the number of their peers without disclosed disabilities continued to rise more modestly. Burgstahler, S. (2001). A collaborative model promotes career success for students with disabilities: How DO-IT does it. Journal of Vocational Rehabilitation,16(129), 1-7. Burgstahler, S. (2002). The value of DO-IT to kids who did it! Exceptional Parent, 32(11), 79-86. Burgstahler, S. (2003). DO-IT: Helping students with disabilities transition to college and careers. National Center on Secondary Education and Transition Research to Practice Brief, 2(3). Burgstahler, S., & Chang, C. (2009). Promising interventions for promoting STEM fields to students who have disabilities. Review of Disability Studies An International Journal, 5(2), 29-47. Burgstahler, S., & Cronheim, D. (2001). Supporting peer-peer and mentor-protégé relationships on the Internet. Journal of Research on Technology in Education, 34(1), 59-74. Committee on Equal Opportunities in Science and Engineering (CEOSE). (2004). Broadening participation in America's science and engineering workforce. The 1994-2003 Decennial and 2004 Biennial Reports to Congress. Grubb, W.N. (1999). Learning and earning in the middle: The economic benefits of sub-baccalaureate education. New York: Columbia University, Community College Research Center. Kim-Rupnow, W. S., & Burgstahler, S. (2004). Perceptions of students with disabilities regarding the value of technology-based support activities on postsecondary education and employment. Journal of Special Education Technology, 19(2), 43-56.